The foods that form the basis of soul food go back more than 400 years, but the term soul food is a 20th century creation. 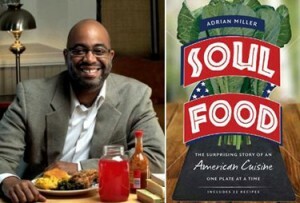 This food has a rich and highly flavored history—today’s National Soul Food Month post shares a few thoughts from James Beard Award winner Adrian Miller, whose book “Soul Food” dishes on the story of this amazing food and the people who’ve produced it. 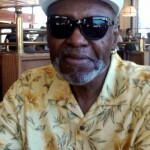 My earliest memory is having a traditional New Year’s Day meal of chitlins, mustard and turnip greens with ham hock (for paper money), black-eyed peas with ham hock (for good luck), candied yams, cornbread and lemon ice box pie for dessert. Absolutely! Greens and black-eyed peas are my favorite soul food items to prepare. I help clean the chitlins, but I let my older brother Duran cook them since he has a great recipe. My mom is so good at making the lemon ice box pie that I don’t even try. ChowChow & Soul: What was the catalyst that created/stimulated your interest in this subject? Even though I grew up eating soul food, I didn’t get interested in writing about it until I read the late John Egerton’s book Southern Food: At Home, On the Road, In History. In that book, he wrote “the comprehensive history of black achievement in American cookery still waits to be written.” I read the book about a decade after Egerton wrote it, so I emailed him to see if he still felt this was true. I thought for sure someone had done it in the interim. He told me that though some had written great books, they had only dealt with parts of the story. So, with no qualifications except for eating this food a lot and cooking it some, I dove in. My mom worked nights, so the kids had to cook breakfast for each other. I’m not even going to pretend that it was really good stuff. I’m talking about classics like Cream of Wheat, pancakes and scrambled eggs with eggshells. Fortunately, I did get better and would make dinner on the weekends to give my mom a break. My earliest specialty was “Indian Tacos” which is essentially a layered dish with traditional fry bread on the bottom, stewed pinto beans, seasoned hamburger and then taco toppings: cheese, tomato, lettuce, salsa, etc. Then I graduated to make soul food dishes. ChowChow & Soul: How did that food memory motivate your interest in becoming the Soul Food Scholar? It wasn’t the food memories so much that put me on the path. It was really the fact that my traditional food had never been adequately celebrated in the mainstream media. In fact, it was getting beaten up on a regular basis. So, I wanted to find out with facts if soul food’s bad reputation was deserved. Everyone should know how to make greens. Greens are a starring attraction on the soul food plate and show a culinary connection with West Africa where greens are also a key part of the diet. Greens are an easy thing to make and they are incredibly good for you. ChowChow & Soul: Time challenged, cooking less, soul food is not healthy, blah, blah, blah . . .Do you think this cuisine will/is becoming extinct and what are your suggestions to keep the soul food legacy alive? I don’t think that soul food will go extinct in the American South because the culinary tradition is too strong. I do think that soul food is on the way out OUTSIDE of the South for several reasons (some which you mention): the decline of home cooking, the growing numbers of African Americans who refuse to be associated with this cuisine and the closing down of so many soul food restaurants. In order to keep the legacy alive, we need to support soul food restaurants and give them a second chance if they let us down. Soul food need to do a better job on the business and customer service side of things. Soul food also needs to become more accessible to people outside of the black community. Other immigrant cuisines have exploded in popularity only because people are at ease with eating the food at ethnic restaurants or at home. Last, African Americans need to embrace this cuisine and get in the kitchen. ing and how much of it. The rich foods often start out as celebration foods which were not meant to be eaten on a regular basis. If folks have more balance in what they eat, use moderation and exercise, the health consequences shouldn’t be so dire. The things that nutritionists are telling us to eat—dark, leafy greens, sweet potatoes, legumes, okra, fish, beans and rice—are the building blocks of soul food. A lot depends on how these foods are prepared. 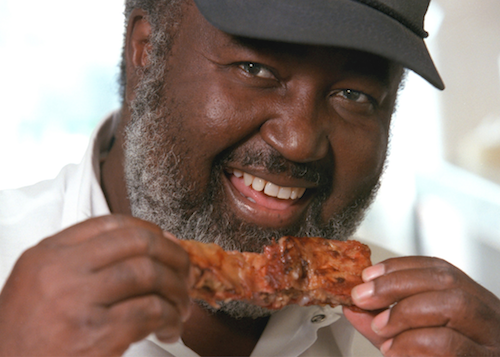 ChowChow & Soul: What is the Soul Food Scholar doing to celebrate National Soul Food Month? I’m going to eat as much soul food as possible! Other than that, I’m going to do some blog posts and social media to celebrate African American foodways and African American cooks. One reason why soul food is so maligned is that people don’t have the facts about its origins and development. I’m doing what I can to address half-baked ideas and misconceptions. ChowChow & Soul: As I recall this is your first book; you hit it out of the park, and won a James Beard Award—what’s next for the Soul Food Scholar? Thanks for the recognition! 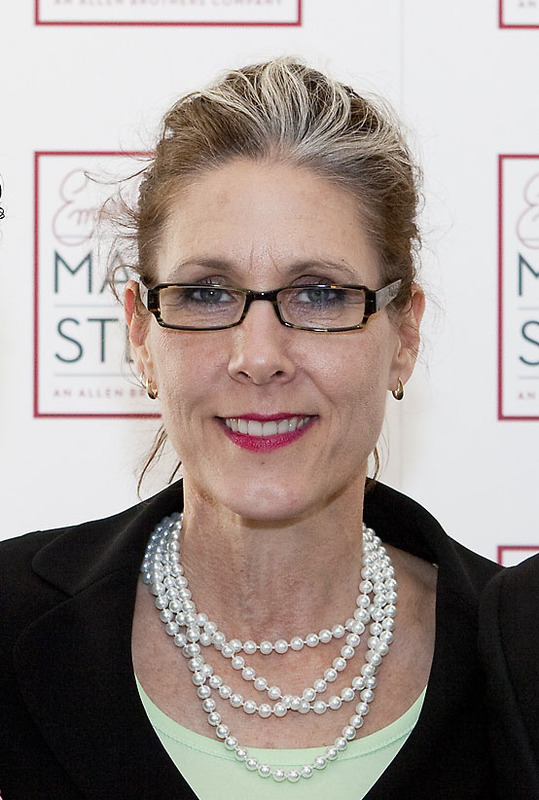 The James Beard Award is such a blessing. I’m now working on something cool that I discovered while writing my first book: every president has had African Americans work in their kitchen. I’ve got their stories and their recipes! I want to create a one-hour television special that will share this hidden history with a large audience. Miller advocates that everyone should know how to cook greens. And greens are one of those dishes that each cook makes their own. Here is Miller’s recipe for the greens he grew up eating. 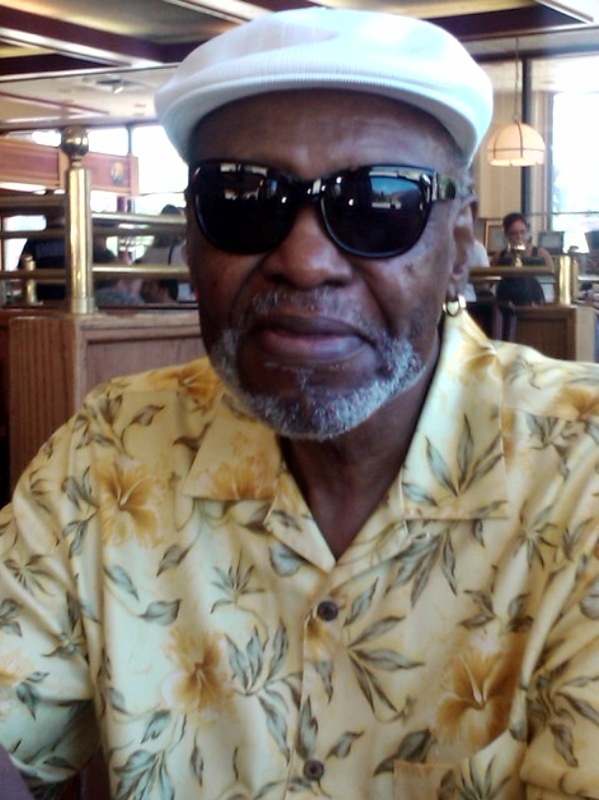 Editor’s Note: Miller has just completed a successful Kickstarter campaign to raise the funds to film the trailer for his documentary project, The President’s Kitchen Cabinet. Miller’s family recipe is a blend of turnip and mustard greens, but collard greens can be used instead of mustard and turnips. Rinse the meat, place in a large pot, and cover with water. Bring to a boil until the meat is tender and the cooking liquid flavorful, 20-30 minutes. Remove and set aside meat if you wish to shred and add some to the greens later. Stir in the garlic, onion, pepper flakes, baking soda, sugar and salt. Simmer until the greens are tender, about 30 minutes. Remove with tongs into a serving bowl and adjust the seasoning. Optional: Add some shredded meat if you desire.